I took advantage of the shade this morning to at last get my carrots and beetroot sown. 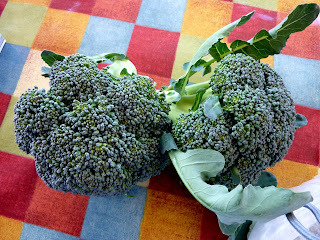 I also watered everything copiously, and harvested the broccoli. I am mighty pleased with these. It is my first foray into growing them and I honestly thought they would be difficult. I don't have much luck with cauliflowers so thought this would be a similar story...but no! I believe that I should get some shoots now I have harvested the tops. We'll see! I noticed that one of the potato haulms was very yellow so decided to see what treasure lay underneath. I dug and dug and couldn't find anything. I was expecting either Foremost, or Charlotte....but couldn't see any spuds at all. I was mighty surprised as the tops were quite big. Then I noticed a little round stone...a bit bluish...picked it up. It was a spud....a dark blue one. 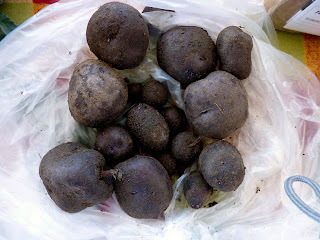 Now I didn't remember getting any blue seed potatoes, nor planting any. But I did notice that this plant had different coloured stems to the rest of them...they were purple...these were green (I think they were). I can only think this was a rogue that I didn't notice when I planted them out. If I em ever tempted to buy some blue seed potatoes to grow I will remind myself how difficult they are to see against the soil when digging them up! At home I gave the plants in the greenhouse a thorough going over...pinching out the excess branches on the tomatoes, and cutting off some of the lower leaves to enable the poor aubergines some light and room to grow. Any day now I will begin harvesting tomatoes as some are quite big already. I trained the cucumber and melons. I noticed that the Black Beauty Courgette in the tunnel is at last managing some female flowers....there are dozens of male ones but only one tiny female...with a 3 inch long courgette behind it. I don't think it likes being under cover. The Parthenon courgette is producing daily. 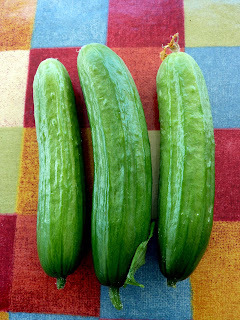 the cucumber is laden with beautiful 6 inch fruits. These are perfect for us...a meal in one cucumber. Blue spuds... I've never heard of those. How strange! Broccoli is a good alternative for people who have trouble with cauliflower - much easier. I am so glad I found that out. What a loss if I had never tried it and never known!!! 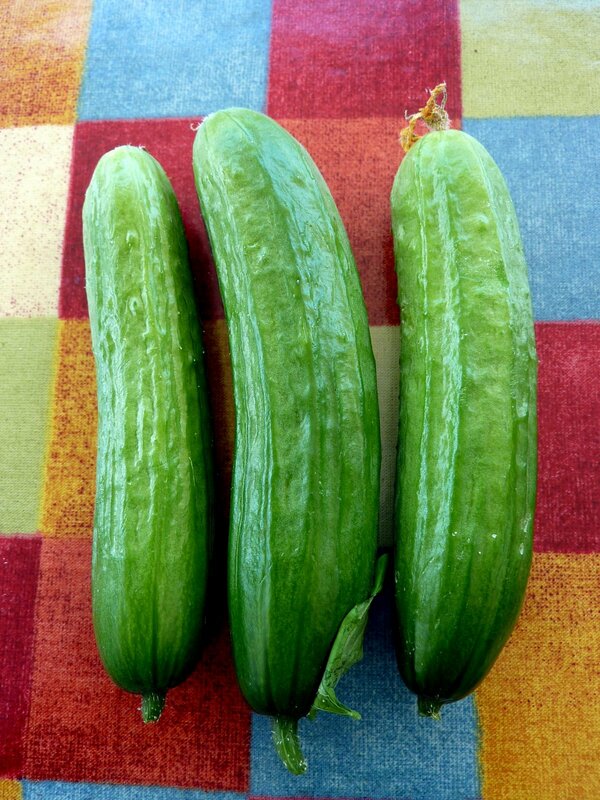 Your cucumbers are weeks ahead of mine. What a brilliant crop! Okay, I have to ask...What do you do with the extra veggies? I can't wait to get a garden going like yours. Also, we are thinking about getting a dog. I noticed you say you have 2 whippets. When they're not running 60 mph, are they real couch potato dogs like I hear? I freeze the extra tomatoes. Make pickled beets and onions, and surplus everything else goes into various chutneys. Whippets are absolutely perfect pets. Two walks a day....the younger one runs and runs in a field if I let him off lead.....then home to the couch as you say. Not big eaters, no grooming fees other than claw clipping, no breed diseases (so no major sized vet bills), not barkers at everything that moves, no moulting, never have to bath them....ever(!....I have never bathed either of them, one is now 8 the other is 5, and they smell delicious!...not doggy), never bite anyone, love their human family members, and get very attached to whoever stays here when we go away and go absolutely nuts with delight when they come again. They hate getting wet, so you never have to suffer that wet dog smell; and you absolutely can't walk them in the rain....they will hold on 'til it stops! Freddy entertains us with a very vocal singing moan when he is bored. It makes us laugh and he can keep it up for twenty minutes. If you get whippets you'll be spoiled for anything else. Your soil is almost black it's so rich! What on earth do you put on your soil to make it so rich? We bought a farm with a lot of topsoil and i used chicken manure to richen it up but it's nothing like the quality of your's. 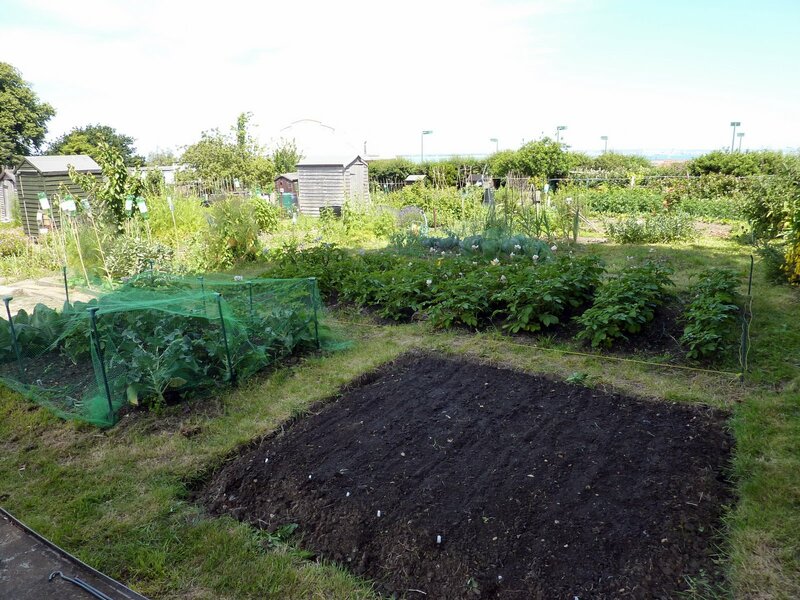 The soil at the allotments is naturally sandy loam, but has had so many years of working that it is now beautiful. 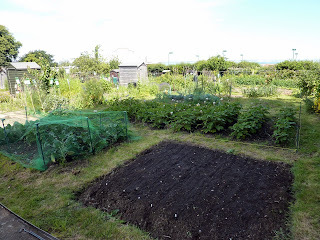 And since I have had the plot I have dug in horse manure annually over most of it. Also all the compost that I make on the plot from the weeds here and the grass mowings from home.